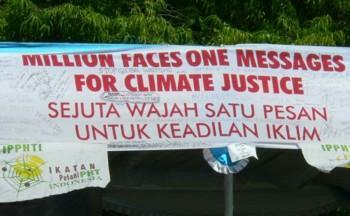 DTE is campaigning for climate justice. We want equitable solutions to climate change which are based on the rights, needs, participation, and agreement of the communities who are feeling the greatest impact of climate change or who will be affected by mitigation attempts. We believe that community management of natural resources that support livelihoods offers a better chance of long term sustainability than top-down development schemes which serve the interests of business elites and reinforce global inequality. Will REDD benefit Papua’s Indigenous Peoples? The following article is adapted from a number of blog postings by Pietsau Amafnini, Coordinator of the Manokwari-based organisation, JASOIL Tanah Papua. The Indonesian language blog is at http://sancapapuana.blogspot.com/. ...and some hopes for securing sustainable livelihoods. Notes from a workshop co-organised by LP3BH, Yalhimo, Mnukwar, DTE and PPP. This new film explores the views of the Mpur community, West Papua, on development plans for their region which will affect their land, livelihoods and culture. Indonesia's forestry department has extended a 2009 deadline for pulp companies to source their wood supply from tree plantations only. Now companies can continue pulping natural forests until 2014.